Depending on what round… or even what minute of a given round… you were watching you could see a completely different Timothy Bradley. At times he was a stick-and-move boxer, working well behind a sharp jab that split Marquez’s guard and snapped his head back, using lateral movement to avoid the return fire. At times he was a counter-puncher, slipping past Marquez’s offence and picking him off with counter hooks and right hands. At times he was a boxer-puncher, standing his ground and throwing a powerful right hand from the pocket. At times he was a pressure fighter, driving forward to land draining body shots. And at times he was a mauler, charging in regardless of the return fire, brawling like a madman, roughing up Marquez. And it was that adaptability, that chance to never let Marquez know what was coming, to change his style and change his approach, that allowed Bradley to constantly have that little edge on Marquez, supported by Bradley’s excellent conditioning and athleticism. Marquez tried hard and did find some success, landing some good right hands, hooks and uppercuts. There were flashes of his brilliant counter punching and some solid combination work. But they were too infrequent, too rare. Bradley never allowed him to get into his game. He never engaged in the sort of exchanges where Marquez is at his best and he never let Marquez settle. Just as Marquez was preparing for Bradley to come forward and brawl with him Bradley would step back and jab until Marquez was made to come forward. And just as Marquez was getting used to coming onto the front foot and being the aggressor Bradley would counter him hard and take the initiative himself. Both came with questions hanging over them and despite the result both answered them affirmatively. Bradley came in with concerns about his mindset and his health after the beating he took in his last bout… and he boxed intelligently while showing a solid chin the few times he was touched. Marquez came in with questions over his 40 year old body and the punishment he had taken in his last bout with Pacquiao (despite his eventual concussive victory)… and he didn’t looked faded, didn’t look shot. Bradley’s jab was probably the story of the bout. 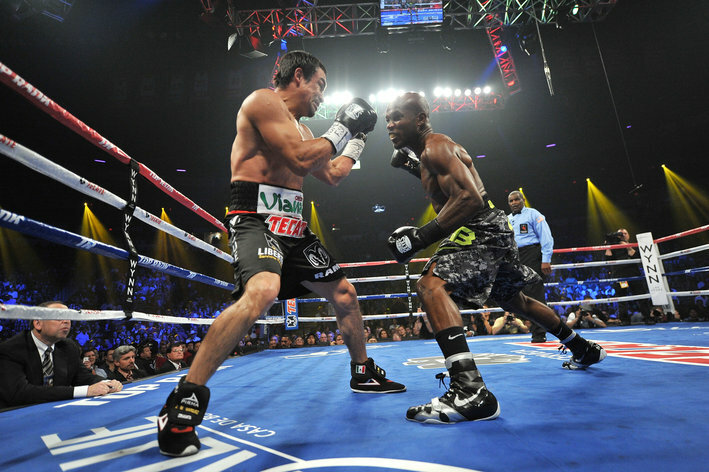 He generally brought it up from low, the so called “up-jab” and Marquez struggled with it throughout the contest. Even when it didn’t land cleanly it disrupted Marquez’ rhythm, threw off his timing and Marquez struggled to counter it. Whatever happened in the bout, whatever Marquez did, whatever he tried, Bradley could always fall back on the jab. Whatever style Bradley used he could always look to… and normally land… that jab. Supporting that, Bradley also worked well with some heavy right hands and a sharp hook… notably one he landed right at the end of the 12th round which buckled Marquez’ legs and may have been the best single punch of the entire fight. For Bradley, his next bout is very much dependent on what happens elsewhere. If Pacquiao defeats Brandon Rios in his comeback (which I expect him to) then a rematch between the pair after their controversial first contest is seemingly an obvious match to make… although Pacquiao may prefer yet another bout with Marquez despite the result tonight. If Rios wins then he becomes a viable opponent… but he may prefer to rubber match with Mike Alvarado. If Mike Alvarado beats Ruslan Provodnikov in their upcoming match he becomes a viable opponent… but he may prefer the rubber match with Rios as well. And if Provodnikov wins against Alvarado, a rematch of his match-of-the-year candidate with Bradley becomes viable… although Provodnikov also becomes a viable bout for Pacquiao or even Marquez. So there are a lot of options… but little certainty. And that’s without hoping for the cold war between Top Rank and Golden Boy to thaw, opening the intriguing prospect of bouts with say Mayweather or Danny Garcia. For Marquez there are likewise options. At 40 there will always be questions about retirement but he didn’t seem slow or faded here, at least compared to how he has been over the last couple of years. If he does make the decision to retire it will be because he didn’t find a bout that interested him, not because his body has broken. And if he does stick in the game, a fifth bout with Pacquiao, whether he wins or loses against Rios (although I suspect Pacquiao will retire if he loses) will always attract interest and thus the fans and thus the money. Outside of that any of the names mentioned above would almost certainly love a bout with Marquez… and stylistically most would seemingly lend themselves to a great, action packed bout. Marquez also has the slight advantage that he only signs deals with Top Rank on a short term basis… if he wishes, he could likely move across the great divide in boxing, opening up the prospect of bouts with the likes of Garcia or Matthysse… and slightly less excitingly the likes of Brook, Khan and the winners of Malignaggi vs Judah and Alexander vs Shawn Porter. The chief support bout was a classic stylistic battle between pressure fighter and a stick-and-move boxer. Former WBO title holder Orlando Salido (boxing for his old belt) basically boxes in one way; he comes forward, barely jabs, looks to land an awkward right hand from range before pounding the opponents body with hooks. Orlando Cruz (probably most famous these days for his exuality) in contrast lets his amateur credentials show (he represented Puerto Rico at the Olympics although he struggled there), working behind a southpaw jab and looking to use movement to confuse opponents while countering when able. The bout basically followed that script; Salido came forward and Cruz tried to hit and move. For the first round or two Cruz did well. He picked Salido off at range and minimised the punches he did take. When Salido got inside Cruz either clinched or quickly slipped to the side. Salido did land (with several of his body shots appearing to creep low) but Cruz looked to be handling them well. But then Cruz stopped moving. Whether it was a deliberate decision by Cruz or it was simply the constant pressure of Salido’s aggression wearing him down, it spelled the beginning of the end for Cruz. He still landed counters… and some pretty good ones at that… but he lacked the firepower to keep Salido away or the defense to block his shots. Salido landed big right hands at range and then tenderised Cruz’s ribs. At that point it appeared to only be a matter of time and despite a strong round by Cruz in the sixth so it was. Drained by the pressure, weakened by the body shots and more and more drawn into the sort of trench warfare he struggles with and Salido thrives on, Cruz could no longer compete and the end came in the seventh, the final touch delivered courtesy of an overhand right but the groundwork laid far eariler. For Salido, the title puts him near the top of an open division and it’s just been confirmed that Top Rank are putting him against Lomachenko in a bout that will certainly draw interest and thus money for Salido. 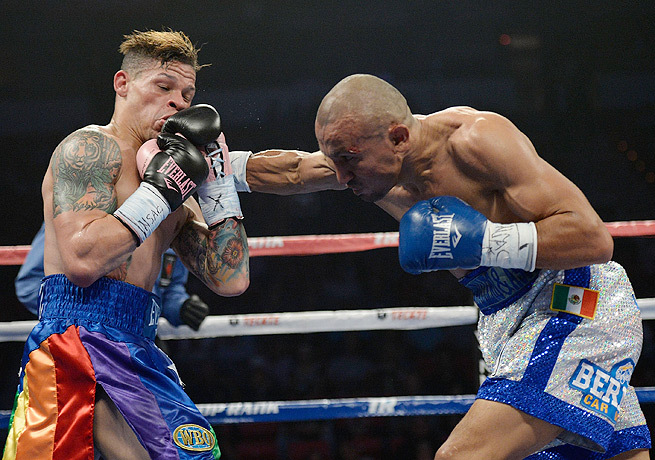 Salido’s ultra-aggressive style may play into Lomachenko’s hands… but Lomachenko has never been tested by someone who will come at his that physically for that long with that much experience and that amount of tricks to fall back on. As for Cruz, he remains what he was. A good but not great boxer who’s not at world level. He’s a tricky, awkward guy to face because of his jab and movement but against boxers who are able apply pressure constantly his movement begins to fade. His story means he’ll continue to bring attention and I imagine he’ll have some relatively soft bouts to recover but I’m not sure he ever wins a world title. Arguably the most intriguing of the undercard bouts featured the official pro-debut (setting aside the mess of whether World Series of Boxing bouts should count) of double Olympic Gold medallist (as well as a whole host of other amateur titles, awards and accolades) Vasyl Lomachenko, mentioned above, taking on veteran brawler Jose Ramirez. The fact that Ramirez was 25-3 and coming off a one-sided upset victory over the fairly decent contender Rey Bautista yet still a massive underdog against a guy without a bout to his name on boxrec is testament enough to the high regard Lomachenko is held in. Ramriez did what he could. He was fearless and active, trying to overwhelm Lomachenko with his aggression and workrate. He tried to make it ugly, to make it hard, to make it difficult for the amateur star. And Lomachenko still boxed circles around him. His footwork was exceptional, his hand speed electrifying, his ability to put together combinations breathtaking. He dropped Ramirez in the first round with a combination, outclassed him for a few rounds more and then ended it in the fourth with a body shot from another combination. 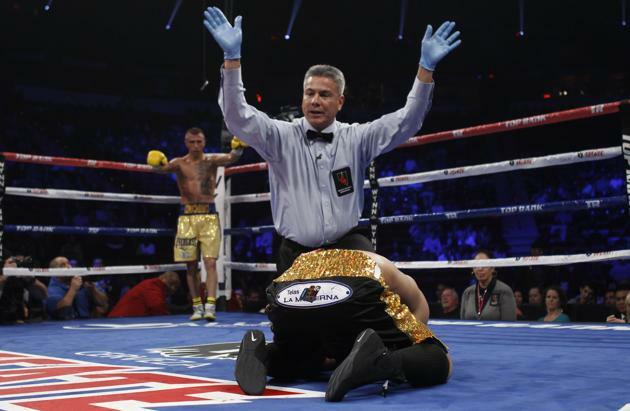 In truth it was hard to find much to fault in Lomachenko’s performance, especially when you consider the level of opponent he was doing it against. His defence wasn’t perhaps quite as watertight as one could hope for and his one-shot power doesn’t appear to be quite there but frankly that’s nitpicking. He’s undoubtedly an excellent prospect, almost certainly the best in boxing. And he’s only 25. A world title in his next bout may be a big ask, especially against an opponent as rugged, cunning and relentless as Salido (as Top Rank just confirmed) but I’m not sure I’d put it past him. 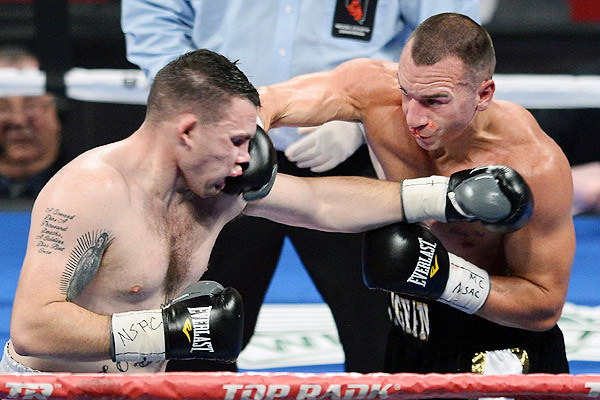 The opening portion of the PPV card featured Sean Monaghan vs Anthony Smith in a bout between two limited boxers. Monaghan was the slightly less limited of the two and it showed, him landing a heavy jab and the odd sharp shot on the way to battering Smith into submission. If that sounds a little dismissive then it sort of is; the story of the bout was how poor Smith was as opposed to how good Monaghan is. That’s not to criticise Smith’s effort or willingness… he certainly tried hard… but the reality is he’s a man who works a day job and boxes for enjoyment and a bit of pocket money. He lacks technical skill and he lacks athleticism and that meant he lacked any chance of winning, his crude brawling style only ever going to get him so far. That limit was found against Monaghan who at least shows a modicum of technical skill both offensively and defensively. I imagine we’re going to see a lot of Monaghan on Top Rank broadcasts. Not because he’s particularly good… he’s not… but because he’s fairly entertaining and a decent ticket seller with the Irish-American community (especially in New York). He’s made to be part of entertaining undercard bouts designed to bring fans in through the doors and fire them up before the more meaningful contests later in the evening. I fear for him if he ever steps up his competition to a significant degree but I imagine Top Rank will be happy to keep him at about this level for a while. The non-televised undercard (avaliable on TopRankTV… something every fan should watch before a Top Rank show) basically went as expected. Every bout featured a prospect or contender against a far lesser fighter and each case the prospect or contender won relatively comfortably. The best performance of the four was likely Jun Doliguez. Coming off a somewhat disappointing draw in his last bout and without much depth to his record the Filipino prospect was across the ring from Giovanni Caro, an experienced boxer who is better than his journeyman-style record indicates, normally only losing to boxers already at world level and who was boxing for world titles as little as two years ago. On paper it looked like it could be a real challenge for the relatively untested Doliguez. Instead Doliguez was too quick and too powerful, handily beating Caro before finishing him in the sixth round after a pair of knockdowns. If Doliguez had the best performance, then Trevor McCumby was the most entertaining. His rematch with Eric Watkins started quickly… McCumby scoring a flash knockdown in the first before Watkins scored a knockdown of his own in the second. From that point it quietened down slightly with McCumby’s greater class shining through but it was still a wild, enjoyable affair, with McCumby scoring another knockdown in the fourth and only a bell stopping another one (and possibly a stoppage) at the end of the fifth. When the decisions were read at the end of the six round contest McCumby was the clear and deserved winner but that doesn’t quite tell how entertaining it was or how much he was tested. The other two bouts went more to the script before the bout. Hard punching French-Canadian Mikael Zewski simply broke down journeyman Alberto Herrera, bloodying his face and hurting him to the point where his corner pulled him out. Talented contender Brad Solomon won a routine but somewhat workmanlike decision over Kenny Abril, using his range, speed and jab to simply outclass his game opponent. Solomon is a frustrating boxer to watch as he seemingly has all the tools to do more than he ever actually does and I can’t help but suspect that the underwhelming nature of his victories is the reason his career has stalled at this level. He’s well past the point where he should be taking on opponents like Abril, however hard they try… he should be in with at least fringe contenders. Until he is, it’s hard to get excited about him. This entry was posted in Analysis, Boxing and tagged Analysis, Boxing, Jose Ramirez, Juan Manuel Marquez, Orlando Cruz, Orlando Salido, Sean Monaghan, Timothy Bradley, Vasyl Lomachenko by consortium11. Bookmark the permalink.